Everyone knows that the U.S. government has grown in size, scope, and power during the past century, but how did this breathtaking transformation come about? Crisis and Leviathan offers a coherent, multi-causal explanation, guided by a novel analytical framework firmly grounded in historical evidence. Integrating the contributions of scholars in diverse disciplines, including history, law, political philosophy, and the social sciences, this book makes compelling reading for all those who seek to understand the transformation of Americas political economy over the past century. One of the most important books ever written on the nature of government power, Crisis and Leviathan is a powerful work of first-rate scholarship whose message becomes more important with each passing day. Foreword by Arthur A. Ekirch, Jr.
How did a federal government that was originally conceived to be one of limited, enumerated powers become so large and powerful in the twentieth century? Robert Higgss Crisis and Leviathan puts forth an illuminating explanation consistent with historical facts, economic understanding, and the role of ideology in social change: A series of national crises eroded the traditional barriers to governments growth, leaving legacies that have endured long after each crisis passed. This ratchet effect also helps explain the decline of economic liberties and the failure of efforts to fundamentally reform government. By conventional quantitative measures, the U.S. government was three to six times as large in the 1980s as it was in 1900. This sounds like a huge increase, but in fact those estimates understate the enormity of the transformation. Thats because quantitative measures (e.g., federal expenditures as a percentage of GDP) overlook the profound qualitative changes that have occurred, such as increased involvement in matters formerly considered constitutionally "off limits" to the federal government. Most explanations for the growth of the U.S. government have failed because theyve tried to reduce complex historical change to a single causal factor. To understand why government has grown, one must understand how it has grown. This requires a thorough, multidisciplinary examination of the motives and capabilities of key government officials and opinion leadersand of the causes and effects of ideological changeespecially during national crises, when the traditional barriers to government growth are weakened. Crisis alone does not cause government to grow; certain ideological conditions must also be present. The economic depression of 18931896 is instructive. President Grover Cleveland faced pressure to provide relief for the unemployed, support an income tax, and abandon the gold standard, but he opposed those measures because they clashed with his classical-liberal ideology. He and his allies were victorious because the ideological climate was not conducive to an expansion of the role of the federal government. The Progressive Era laid the foundation for the federal curtailment of economic liberties during World War I. The federal income tax and the Federal Reserve System were two key legacies of the Progressive Era, but even more important was the profound shift that occurred in the thinking of the nations intellectuals and business leaders. Some business leaders benefited greatly from the governments restriction of competition and other wartime controls. FDRs attempts to pull the economy out of the Great Depression failed for many of the same reasons that Hoovers efforts failed. In the Depressions early years, President Hoover raised federal spending and dissuaded business leaders from letting wage rates fall with the contraction of spending caused by a rash of bank failures. Unfortunately, rather than abandon this course, President Roosevelt pursued it on a bolder scale, astutely manipulating the publics fears to push through his arch-activist New Deal agenda. Production for the private economy did not return to pre-Depression levels until after the conclusion of World War II. World War II and the Cold War secured exceptionally high profitability for defense contractors, who became a potent political lobby. During World War II, one hundred firms got two-thirds of the war business and just thirty-three got about half; General Motors alone got 8 percent. During the Cold War the ongoing development weapons systems, and the great migration of retired military officers into the defense industries, practically insured that the military-industrial complex would prosper. Everyone knows that the U.S. government has grown in size and scope during the past century, but how did this breathtaking transformation come about? In Crisis and Leviathan, economist and historian Robert Higgs shows how Big Government emerged from responses to national emergencies that occurred as attitudes about the role of government were changing dramatically. In particular, governmental responses to the Great Depression, two World Wars, the Cold War, and various minor crises (real or imagined) led to a host of new federal programs, activities, and functions that left legaciesincluding greater acceptance of bigger governmentthat endured long after each crisis passed. The result was not only a new baseline for further growth, but also a government more intrusive in the lives of ordinary citizens and more resistant to meaningful reform. 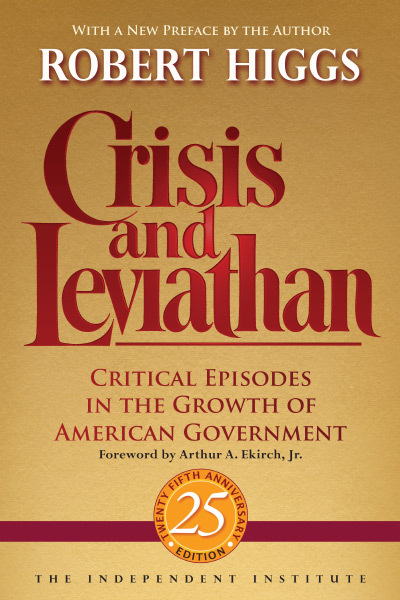 One of the most important books ever written on the nature of government power, Crisis and Leviathan is a powerful work of first-rate scholarship whose message has become more important in the twenty-five years since its original publication. The book begins with a critique of competing explanations offered by scholars to account for the growth of the U.S. government since the early 1900s. No single cause explains the rise of Big Government in America, according to Higgs. He proposes a multi-causal theory that puts human agency in the drivers seat. Big Government, he explains, is not One Big Nonhuman Thing with a unity of purpose; rather, it comprises many coexisting human institutions, each one rife with the struggles and rivalries of individuals who possess clashing objectives. Moreover, Big Government requires the support, or at least the toleration, of people outside of government; and some people are always circulating between the rulers and the ruled. Always, peoples ideologies shape their political behavior (a truism that many social scientists fail to incorporate into their analyses). The growth of government, Higgs emphasizes, has been not a steady climb, but a rocky path punctuated by growth spurts during national military or economic crises, when the traditional barriers to the growth of government face tremendous pressures. Although increases of federal spending and governmental controls often subsided after a crisis ended, those episodes left institutional and ideological legacies that raised the secular growth rate of the government during subsequent, non-crisis years. This progression of two steps forward, one step back helps explain what Higgs calls the ratchet effect. The rest of Crisis and Leviathan employs the framework established in the books beginning chapters to shed light on the pivotal events of twentieth-century America. National emergencies alone do not cause the growth of government: ideological conditions that favor its growth must also be present. The economic crisis of 1893 to 1896 is illustrative, Higgs shows. As the unemployment rate soared to 18 percent of the total workforce, legions of unemployed men marched toward Washington, D.C., demanding federal relief. President Grover Cleveland would have found it politically easy to accede to their demands, but doing so would have run counter to his conviction that the Constitution left such matters exclusively to local governments and private charity. He also resisted pressures to abandon the gold standard and to endorse legislation to reinstate the federal income tax. Because Cleveland and his allies clung steadfastly to an ideology that espoused the rule of law, private property rights, and public peace, the old regime of classical liberalism withstood pressures for greater federal intervention in the economy. The turn of the twentieth century ushered in the Progressive Era, during which the elites who shape public opinion increasingly embraced federal activism and derided traditional views that espoused free-market economic policies and limited government. Perhaps the most striking transformation involved the attitudes of big businessmenrailway presidents, financiers, and captains of industryespecially among the Eastern elite. Some business leaders jumped on the Progressive bandwagon to serve their narrow material interests. Whatever their motives, big businessmen would play a key role in the new political economy. Although government authority grew during the Progressive Era, as late as 1916 the American economy was still mostly a market system. U.S. reaction to the war in Europe, however, led to unprecedented federal intervention in the nations economic affairs. It began with legislation, introduced before U.S. entry into the war, that regulated ocean shipping rates. Soon after, the government would operate competing ships and the President would gain authority to compel suppliers to sell to the government at reasonable prices or risk confiscation. Six weeks after the U.S. declaration of war, President Wilson signed into law the Selective Service Act, thereby saving the government the expense of paying soldiers a market wage. Government agencies such as the War Industries Board directed what came to be called war socialism: collectivist economic planning on an unprecedented scale. Looming over everything was the ideological shift. Americans had won the war, or at least they had been on the winning side, and many attributed the defeat of the Central Powers to the wartime collectivism. The normalcy that returned after the armistice was eventually destroyed by the onset of the Great Depression. President Hoovers unprecedented interventions failed to revive the economy. President Roosevelt, a shrewder politician, relied on the emergency rationale and the wartime analogy to push through a host of programs during the frantic Hundred Days after he took office in March 1933. Wartime precedents helped enable new programs such as the Reconstruction Finance Corporation (modeled after Hoovers War Finance Corporation), the restrictive New Deal gold policy, the Tennessee Valley Authority, and agencies regulating agriculture and labor relations. Most traditional restraints on federal power gave way. The Supreme Court struck down some legislation, but Roosevelt ultimately won: changes in the Courts composition led to a revolution in constitutional jurisprudence that weakened the protection of private property rights and gave federal economic regulation free rein. The governmental response during the worst years of the Great Depression (19321933) left the most enduring legacies: federal lending for many different purposes; federal production and sale of electricity; federal manipulation of agricultural production, prices, and marketing; federal regulation of virtually every aspect of labor markets; a vast federal social insurance system; a plethora of anticompetitive federal laws; and a large variety of federal subsidiesthe list could go on. The ideological legacy was even more important. Elite opinion no longer questioned the propriety of federal economic interventionduring emergencies or otherwise. The promise of social security and protection from the rigors of market competition became entrenched in the national mindset. The power and managerial expertise acquired by the federal bureaucracy during the New Deal hastened the development of economic controls during the Second World War, mobilization for which began at least a year and a half before the attack on Pearl Harbor. In mid-1940, Congress expanded the powers of the Reconstruction Finance Corporation, enabling the government to make loans to, or purchase the capital stock of, corporations involved in strategic and critical materials. The Selective Service Act, enacted in September 1940, not only established the nations first peacetime draft, but it also empowered the President to requisition supplies from private industry and to impose harsh penalties on noncompliant suppliers, including government takeover. Congress broadened the Presidents discretionary authority to deal with private suppliers by passing the First War Powers Acts, enacted after Pearl Harbor, and the Second War Powers Act, enacted in March 1942. The latter also enabled the Treasury Department to use the Federal Reserve System as a virtual printing press to help finance the governments ever-growing deficits. This new power was too great to resist, and the ensuing price inflation prompted the passage of the Emergency Price Control Act of 1942. A presidential edict issued on April 8, 1943, brought virtually all wages and prices under federal control for the duration of the war. The wartime chaos also created labor unrest. On January 12, 1942, the President created the National War Labor Board, patterned after the War Labor Board of World War I, to resolve disputes by mediation or arbitration. The board possessed the authority to enforce its decisions through plant seizures. Eventually dozens of seizures were ordered, some involving entire industries. Although much of the administrative apparatus of control was quickly dismantled after the war ended, a host of legacies remained, including the government-financed plants and equipment; the Employment Act of 1946; the Taft-Hartley Act; the Selective Service Act of 1948; the GI Bill; a voracious and effective federal income-tax system; and a massive foreign-aid program. Most importantly, the notion of a peacetime Constitution was lost, and the prevailing ideology moved toward the acceptance of a large role for government in the economy. Three decades of crisis after crisis left the free-market system constrained and corrupted almost beyond recognition. They also established a pattern, repeated during subsequent so-called crises, including the urban crisis, the environmental crisis, the consumerist crisis, and the sundry crises associated with the decades-long emergency known as the Cold War. Each episode reinforced shifts in public beliefs and attitudes about the proper role of government. What to make of this? The economist Joseph Schumpeter predicted that the free-market system would degenerate into socialism. Despite his powers of observation, he overlooked the eagerness and ability of Big Business to secure government subsidies and barriers to competition. He also overlooked the significance of a governmental class whose material and ideological interests diverged from those ascribed to the bourgeoisie and the working classes. A climate of ongoing national emergencies helped transform the U.S. political economy into an example, not of socialism, as Schumpeter had predicted, but of a type of collectivism that maintains the pretense of private property rights: call it participatory fascism. The prospect of reversing course is not encouraging, but neither is the continued growth of Leviathan foreordained, Higgs concludes.